Would you have won the audition for Darth Vader’s voice? It was 1977 in California. A film production team was working hard to show to the world the new science fiction hit. They were truly behind schedule. The movie was “Star Wars.” Most of the film scenes had been already shot months earlier in 1976, including the ones of its singular villain Darth Vader, performed by actor David Prowse. However, director George Lucas wasn’t fully pleased and felt that the villain character needed a darker and deeper voice. He searched for actors who could contribute with the voice only. 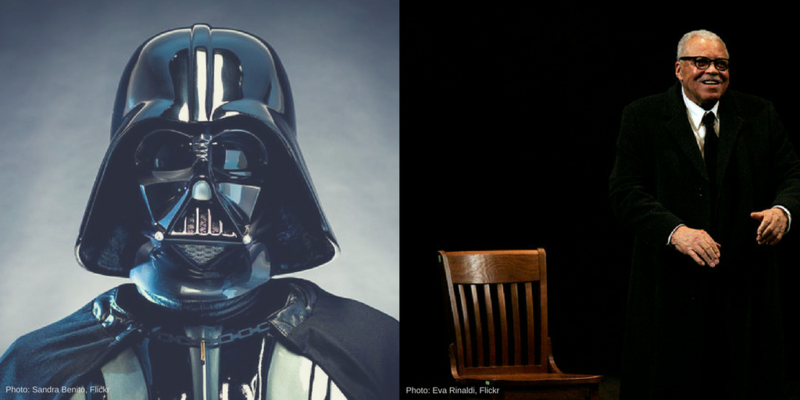 After several ideas and auditions, Lucas ultimately chose James Earl Jones. An experienced and awarded actor in theater, Jones was relatively unknown in the movie industry. In his own words Jones said “Lucas chose a voice born in Mississippi, raised and Michigan and was a stutterer.” The rest is history. We all have watched countless movies and heard the voices of hundreds or thousands of characters. If I asked you, how many of these voices you can imagine right now, what would you say? Probably very few. Star Wars’ darkest villain is among these voices you need to hear just a phrase to paint a picture of him on your mind. Like in movies, in other forms of arts, entertainment, politics and business, there are iconic voices that stand out. No matter how many years will pass by, we will always recognize these voices, and will probably feel the same emotions. Today, some speakers have these iconic voices. Do you have one? The truth is , building an iconic voice takes time and consistent work. No matter how unique and beautiful your voice is, an iconic voice isn’t innate but is built on effort. Can you imagine Darth Vader’s voice getting dry and weak after speaking loud for 15 minutes? Can you imagine Diva Plavalaguna’s voice becoming shaky in the middle of her interstellar performance of “Il Dolce Suono” in The Fifth Element? Peak performance singers rely on diaphragmatic breathing and the regular use of vocal exercises. In spite of that, even some of the top singers are known for their laziness about vocal exercises and they admit that is a mistake. A mistake we should never make. Can you imagine Arnold Schwarzenegger’s voice instead of being enriched by his foreign accent getting buried by inaccurate and unnatural sounds? Professional actors spend hours perfecting a great articulation and creating patterns that sound natural in their acting language. Certainly, part of why Lucas chose Jones for Vader’s voice was his inborn timbre. But that was not enough. Remember that he was a stutterer once. Jones had worked countless hours to build that voice. At the time of the audition, Jones was an accomplished theater actor. He was ready for a big opportunity. Perhaps you are not pursuing an actor’s audition today. If you are a speaker, you want to be noticed by a successful bureau. If you work in a team, you want to become the next team leader. Whatever you do in life, see your next big opportunity as your next audition. Be as prepared as Jones was back in 1977. Are you ready for winning your next audition? Do you want to learn more about how to build an iconic voice? Go here to try Roger Love’s course The Perfect Voice.